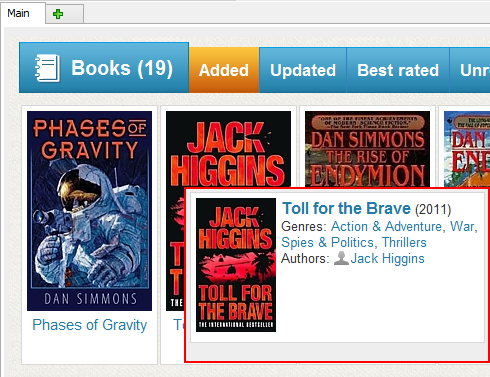 When you put the mouse cursor over some book's title or cover, Booknizer shows a popup preview for the book. The preview typically contains some basic information: cover, title, author, genres, year, rating. Such previews are displayed only in the right-hand area of the program. Once you move the mouse elsewhere, the popup disappears. No items in the popup can be clicked (although some of them may look like links). If you have downloaded information about an author and check the author's bibliography, you may notice that there are no previews for some books. 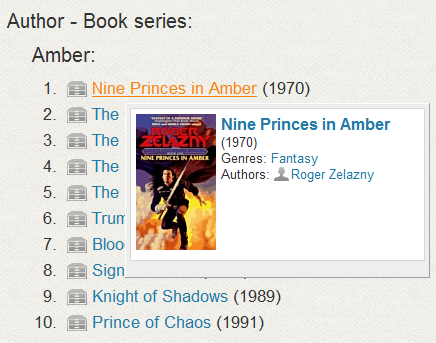 Booknizer shows previews only for books that are in your collection (have the "In collection" flag set). This will disable popup previews both for books and for persons (authors, editors, translators).